Its a beautiful day here in little ol' Adelaide :) The sun is shining, the sky is a pretty blue, the birds are singing and our cat is snoozing on the window ledge - with one eye open (as cats do), waiting for her feathered friends to get closer. Its getting closer to Christmas day, so we're cleaning and tidying, in preparation for all the mess that tinsel makes when you hang it all over the house! Of course having our cat help hang the tinsel might have something to do with that. 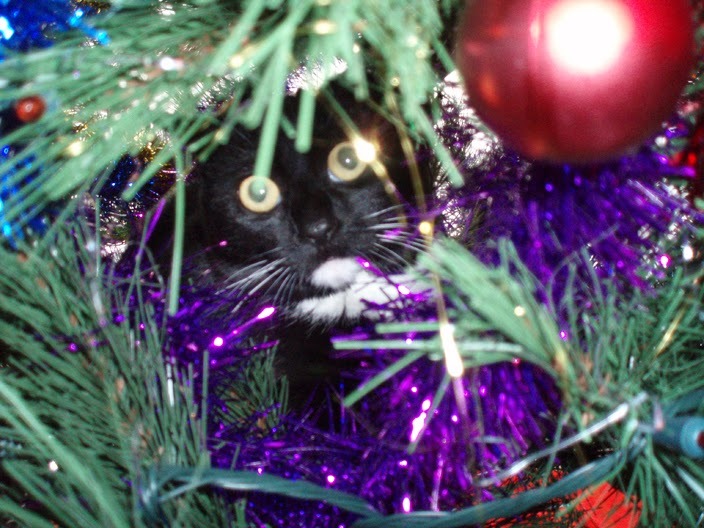 Here she is "helping" in the Christmas tree. This is our adorable cat Socks helping in the Christmas tree. photo was taken a few years ago. Each year I also painting pictures and messages on the front window, hang ragdoll angels and santas (made by my bestie!) on our doornobs, display a little antique nativity scene complete with five wise men (the three traditional men plus my two amphibian wise men) and Santa, and add a beautiful red ribbon to our paper mache kangaroo. 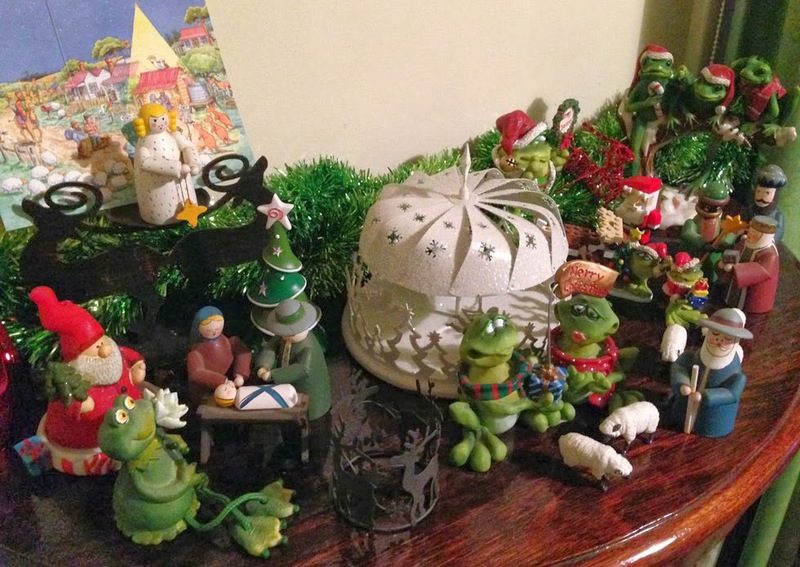 My antique nativity scene from Christmas 2013 with two gift-bearing frogs. When we were children we used to thread coloured, sugar coated popcorn on cotton and hang it on the Christmas tree along with the usual striped peppermint candy canes and chocolate baubles. We only hang candy canes now with other decorations, and eat the chocoloate baubles if we get any - it just melts if we hang it on the tree! It seems so much effort for a few weeks of the year but it makes so many people smile! And our cat just loves playing with it all and trying to knock everything over... a nice change for her from the usual toys of empty boxes and scraps of paper! Its all good, nothing is breakable and its fun for everyone.